Graduate students and faculty at the New School for Social Research break down the conventional boundaries of thought-and then redraw them. Grounded in theoretical criticism, interdisciplinary exploration, and dissection of the world today, our students and faculty produce scholarship that challenges the status quo and shapes public debate. 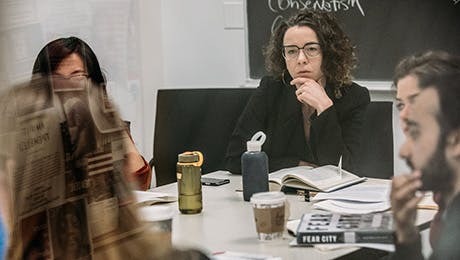 Carrying on the tradition of The New School for Social Research, graduate students and faculty produce scholarship that inspires critical discourse. Through the creation of distinct, rigorous, and engaged work, The New School's array of journals and publications convenes conversations that influence thought throughout the world. Our leading centers and institutes foster interdisciplinary research, fuel policy debates, and promote public discussion about the most pressing social issues of our time, drawing on the university's wide-ranging resources, faculty, and diverse ideas.